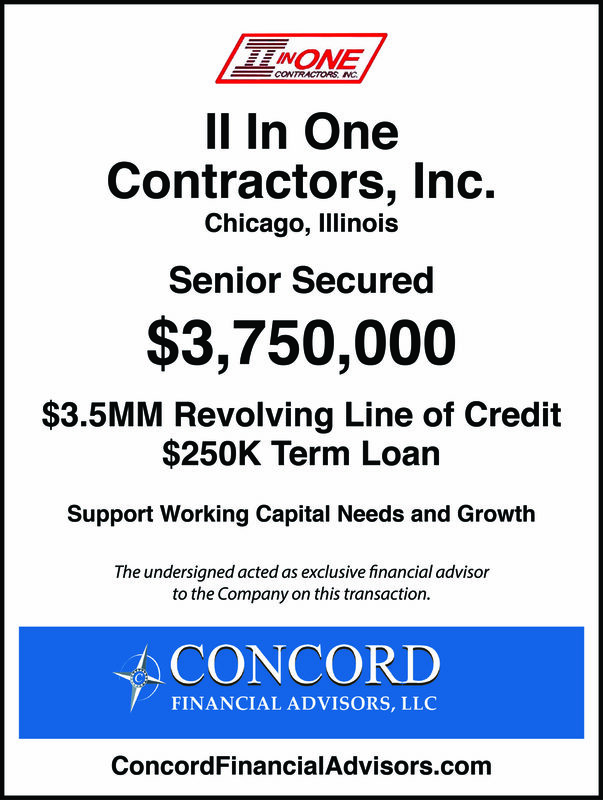 II In One Contractors, Inc.
Concord Financial Advisors, LLC closed a $3,500,000 Senior Secured Revolving Line of Credit and $250,000 Term Loan for II In One Contractors, Inc. (“Company”) located in Chicago, IL. The Company specializes in carpentry, excavation, form and place concrete, masonry, reinforcement steel placement and structural steel erection. Concord created a detailed memorandum featuring the Company’s seasoned management team and its industry position as one of Chicago’s leading minority-owned contractors. Utilizing Concord’s 100+ years of collective corporate finance experience and strong relationships with multiple lenders, Concord quickly identified qualified banks and other financial institutions that were knowledgeable in the industry. After conducting a targeted search process for local banks who understand the industry, Concord secured a very attractive loan structure from a local bank that met all of the Company’s financing objectives.